Teenagers Luke Wilson (left) and Nedas Maciulaitis full of smiles. For 80 minutes it appeared Portadown’s season of death by a thousand cuts was set for the final decisive blow. Then, with four teenagers on the pitch for the Ports, two goals in three minutes turned the game around and secured senior status for another week. Luke Wilson fires home the winning goal on his senior league debut. With a maximum haul of 15 points available ahead of kick-off and Carrick Rangers enjoying a lead of 14, anything less than victory for basement-based Portadown would have cemented automatic relegation into the Championship. 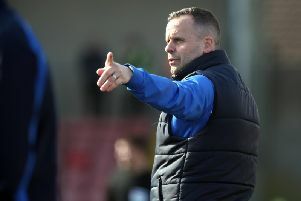 A campaign dominated by off-the-field issues and Irish Football Association-imposed disciplinary measures covering points deductions, fines and a transfer embargo left the Ports just 90 minutes away from confirmation of the drop after months of turmoil. However, goals by Niall Henderson and 16-year-old Luke Wilson rescued the match - and, temporarily, the season - to complete a fightback following Martin Murray’s penalty for Carrick. It marked a dream senior league debut for the composed Wilson. Even if the 2-1 home win proves, as logic dictates, a short-term reprieve, Ports boss Niall Currie was full of praise for the passion within the performance behind a first league win since December. “The pleasing point was we asked for honesty,” said Currie. “I felt we were the better team and created all the chances, with Luke Wilson superb, a wonderful talent. “Callum, Nedas Maciulaitis and Ross Larkin were also superb but it takes the right people around them and, irregardless of the result, we have to deliver, show some self-pride and do our very best to finish the season with 100 per cent effort for the supporters. The Ports enjoyed the majority of sights of goal across the first half - with Matthew Hazley, Stephen Hughes,Henderson and Sean Mackle coming close compared to a sole strike on target of note by Carrick’s TJ Murray that Chris McGaughey pushed on to the crossbar. Carrick gained the edge, however, after the break when substitute Tommy Elder was fouled by Ross Larkin and Murray stepped up to slot home a penalty kick on 55 minutes. Carrick enjoyed a spell on top before the afternoon’s second spot-kick handed Portadown an opportunity to equalise, with referee Neil Robinson pointing to the penalty spot after consulation with his assistant following a tussle between Daniel Larmour and 15-year-old Callum Ferris. Henderson converted the penalty and handed Portadown some late momentum which led to a winning goal within moments thanks to Hughes’ cutback for Wilson to convert. Rangers boss Aaron Callaghan finished frustrated with the performance of his players and the match officials. “I felt it was a really bad game, we were very poor and Portadown not much better,” said Callaghan. “I have to question the attitudes of some of the players as it was the worst performance I’ve seen from the club in a long time. “I also have to question the decision to give Portadown the penalty as I think it was just two lads challenging for the ball. “The penalty changed the momentum of the game as Portadown could then throw people forward as they were fighting for the result. “But our performance cost us the game. “We were controlling the game at 1-0 without playing well.